Samsung Q8D (QE55Q8D) review: is it as sensational as the Q9FN 4K flagship? 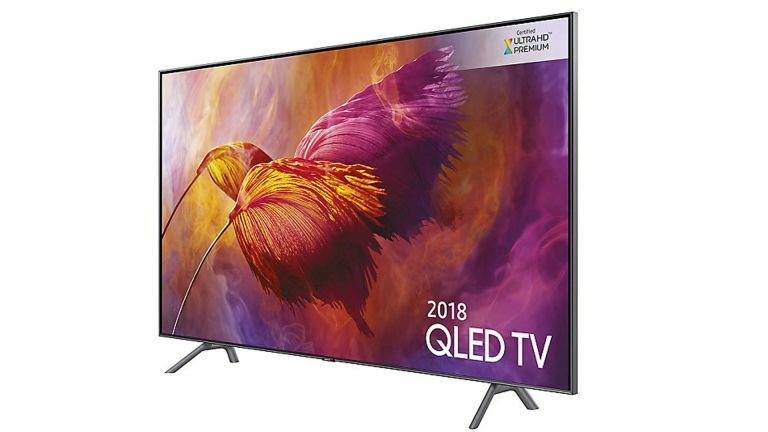 With punchy HDR and excellent bright room performance, this QLED telly is a formidable proposition, and particularly so if you game as much as you binge-watch. It’s taken Samsung time to hone QLED technology, but hot on the heels of the sensational Q9FN comes the step-down Q8D. It may be a little less sophisticated, but it’s still a head-turner. Like its more expensive stablemate, the Q8D is a FALD (full array local dimming) flatscreen. Individually addressable zones can manage brightness and colour better than an edge-lit set. Suffering a bit of an identity crisis, it’s referred to both as the Q8D and the Q89DN in the UK, and the Q8FN Stateside. To confuse even further, there are a two additional variants in the Q8 family. The Q8C is curved, while the Q8F is thinner and uses Samsung’s One Connect junction box for power and connectivity. While we’d hesitate to call this set good-looking, it’s sturdy in the extreme, thanks to two widely spaced feet. Unlike the Q9FN, the TV doesn’t use a One Connect box for cable spaghetti or power. It takes a more conventional approach, which many will find easier to accommodate. The bezel is basically non-existent, giving an edge-to-edge picture. The rear panel is dramatically ribbed; it looks like a furrowed field with cable management. All four HDMI ports (which includes ARC on input 4) are compatible with HDMI 2.0, and support 2160p/50/60 4:4:4 and 4:2:2. It’s worth remembering though that you need to manually assign compatibility using the HDMI UHD Color toggle in the setup menu. In addition, there are two USB inputs and Ethernet LAN (to compliment onboard Wi-Fi and Bluetooth). Tuner provision covers Freeview HD (but not Freeview Play) plus satellite. The Q8D comes with two remote controls, a standard IR wand and a fancy Bluetooth touchpad with integrated microphone. Ask the screen nicely and it’ll display photos or show you the weather. The model is available in 75-, 65- and 55-inch screen sizes and it's the latter we’re looking at here. Model names are, as you'd expect, QE55Q8D, QE65Q8D and QE75Q8D. Image quality is impressive straight from the box. Picture modes are standardised for both SDR and HDR, with Dynamic, Standard, Natural and Movie offering a variety of viewing experiences. For most of us, Standard and Natural will be the go-options. The former has a pleasingly high average picture level, making it a reliable choice in brighter rooms; Natural offers greater contrast, but can result in a loss of shadowed detail in darker scenes. That said, it often tends to look more authentic. When hopeless stoner Seth Rogan pulls up outside the house of drug lord Gary Cole late at night (Pineapple Express, UHD Blu-ray), the interior of his vehicle is largely lost in the darkness. In Standard mode, the car interior is more obviously lit. Similarly, when corrupt cop Rosie Perez gives chase after the subsequent murder, the shrubbery behind her is largely lost in darkness. In Standard mode, it’s a little too brightly defined to be convincing. Movie is generally the most unpleasant image preset, offering jaundiced skin tones and dulled down highlights. This being a Samsung, there’s a goodly number of additional adjustments that can be made under the Expert Settings tab. In addition to the usual Backlight, Brightness, Contrast, Sharpness and Colour selections, there’s Digital Clean View (to combat banding), Auto Motion Plus, Local Dimming control, and Contrast Enhancer. An HDR+ mode sets out to create an HDR-like effect from SDR sources. we’re not overly convinced, but it’s there is you want it. Digital Clean View, can be left on Auto, set Low or turned off. Take the middle ground. For most of our audition, Contrast Enhancer was set Low. When it comes to motion handling, our preference was to turn Auto Motion Plus Off, to mitigate against motion artefacts. The screen makes a wonderful job resenting high frequency UHD detail. Definition is crisp to the edge of the screen. HDR support covers HD10, HDR10+ and HLG. Samsung rates performance as HDR 1500, not a metric that translates beyond its own sales blather. For the best peak brightness in HDR, ensure Local Dimming is set High. We measured a peak of just over 1100 cd/m2 (aka nits) with a 10 per cent window. But that’s not the whole story. The screen is actually marginally less bright with HDR highlights in a 5 per cent window, which can impact transient dynamics during real-world viewing. The local dimming algorithm also seems a tad tardy; it often seems to take several seconds to ramp up those HDR peaks. That said, this LED LCD screen will comfortably handle most HDR content, both in terms of dynamics and colour depth. QLED colour vibrancy is high, and black level performance is phenomenal for an LED LCD panel. Those CinemaScope movie bars are always solidly black. The Q8D isn’t just recommended for movie fans though; it’s a great choice if you’re a gamer, although there is a caveat. Activate the Game mode and input lag is a reasonable, if unspectacular, 28ms. Deselect Game Motion Plus (a mode that adds interpolation to improve sharpness in low frame rate games) and image lag drops to a mere 14ms. Audio quality is good enough, with a decent level of volume and weight. The onboard sound system is downward firing, so don’t expect much stereo width. It’s worth partnering a TV of this calibre with a high performance soundbar or full AV system. The set’s best new trick is Ambient mode. This allows it to either function as a news or weather terminal when in standby, go chameleon with your wall, run a photo gallery, or simply play music. Samsung’s smart platform is well supported. YouTube, Netflix and Prime Video all play 4K. While it lacks a rollback programme guide, there’s still BBC iplayer, ITV Hub, All4 and My5 catch-up. The QLED 8D is an impressive 4K HDR screen. If you thought that OLED had the monopoly on subterranean black levels think again. Coupled with an excellent HDR performance and rich, engaging colours, the Q8D is more than a match for most HDR sources. The set also has a decent smart platform, and is a phenomenal gaming display. At the moment we'd pick the brighter, higher-spec Q9F over this, if we were out QLED shopping. However, when the launch price point slackens a bit, perhaps next Black Friday, we think this will definitely be a set to shortlist.